Design advantages for use in poor process conditions (click for larger view). Clean, dry instrument air is critical for pneumatic instruments and actuators to work properly. In remote, dirty process control environments, like refineries, chemical plants, power plants, water treatment facilities, pulp & paper mills, or mining facilities, providing clean instrument air is challenging, costly and problematic. Along with poor instrument air, the ambient air in these areas is generally filled with dust and contaminants. Process equipment must be engineered to withstand these conditions, and devices with low tolerance to dust, dirt, condensate, and poor ambient air quality (such as rack and pinion actuators) are to be avoided. Devices in these areas are costly to maintain as shut-downs and repairs are very expensive. For the operation of pneumatically controlled valves, and as a better alternative to rack and pinion actuators, Kinetrol rotary vane actuators are an excellent choice. Their simple design, with one moving part, and an elegantly engineered vane, inherently protects the actuator from bad instrument air. 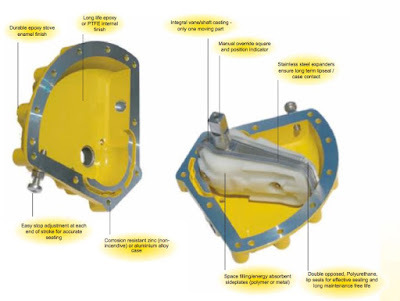 Kinetrol's use of double opposed polyurethane lip seals, backed by stainless steel expanders, ensure long-term lip seal contact and effective sealing for years of maintenance free life. The vane, lip seals, and expanders actually provide a self-cleaning, or wiping, mechanism for any moisture, dirt or dust entering the interior of the actuator. In effect, the vane actuator's design "sweeps away" the debris that will cause other actuators to fail. A considerable cost savings can be calculated given the trouble-free performance Kinetrol vane actuators provide. Assuming both a Kinetrol and standard rack and pinion actuator cost approximately the same, and that the life of a typical rack and pinion actuator in these environments is approximately 1 year, you can easily see the savings. By factoring in the replacement cost for an new actuator, and the cost of labor to install, you’ll find a standard rack and pinion is at least 2.5x the cost of Kinetrol over a 2 year period. Kinetrol actuators have a well-earned reputation for operating trouble-free for years in the most difficult environments. Considering their years of maintenance-free service, it’s easy to understand the significantly lower total-cost-of-ownership they deliver. For more information, visit Kinetrol USA at http://www.kinetrolusa.com or call 972-447-9443.